On occasion I have a need to determine if a specific IP falls within a given subnet. If for example it were an IP such as 192.168.1.80, and the network is defined as 192.168.1.0/24 (24 = subnet mask of 255.255.255.0) it is pretty obvious. However when using classless subnetting and less common subnet masks, such as those supplied by ISP’s, it is a little more involved. As a second example consider the IP 12.34.56.80. Is it part of the same subnet as 12.34.56.78/29 (29 = subnet mask of 255.255.255.248) ? You can certainly do manual calculations using binary numbers like 00001100.00100010.00111000.01100100, or with the Internet readily at hand you can use subnetting calculators. 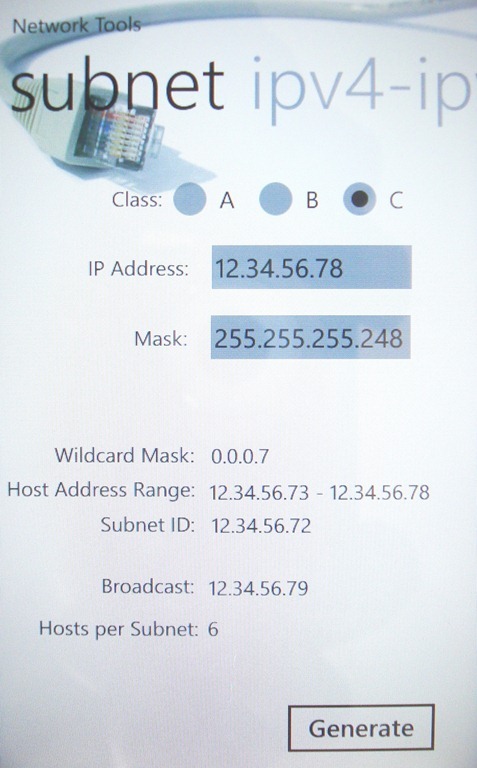 I recently stumbled on a great little free app for Windows Phone 7 called Network_CalculatorV2. It is a very handy tool to have in your pocket the few times you might need it rather than searching the internet for that site you found last year, but can’t seem to find now. It will also do pings to IP’s and DNS names, but it is the network calculator that I found particularly useful and simple to use.